Fendall, L.S. and M.A. Sewell. 2009. Contributing to marine pollution by washing your face: Microplastics in facial cleansers. Marine Pollution Bulletin 58: 1225-1228. The fate of our plastics is often an afterthought. In general, plastics are everywhere! They’re used in nearly every facet of human life, such as packaging, cooking, cleaning, and personal hygiene. The fate of many larger plastic items, known as macroplastics, is the landfill where it could eventually end up in the ocean as pollution. Satellite images show that this plastic pollution is concentrating in certain parts of the ocean where it forms visible patches, such as the North Pacific Garbage Patch. These plastic items can threaten marine life through entanglement and consumption, and they have become a main focus of awareness and conservation. Example of microplastics washed ashore on a beach. Note the different shapes and sizes. There has been a growing concern over smaller plastics, known as microplastics, and their potential to enter our marine environment as pollution. Microplastics are typically smaller than a sesame seed, and can come from a variety of places: macroplastics that break down over time, or natively in products containing microplastics like soaps and cleansers. Previously, products containing microplastics were thought to be only a minor source of plastic ocean pollution. However, many facial cleaners have rcently shifted away from natural exfoliants to microplastics of various forms, such as microbeads and micro exfoliants. Once these face washes are used, they are rinsed off, flushed down the drain, travel through wastewater treatment centers, and eventually end up in our oceans. The average consumer who uses face cleansers on a daily or weekly basis may be greatly contributing to the microplastic pollution in our oceans. The fate of these microplastics and their impact on our oceans and marine organisms is partly unknown, and needs to be a focus of future research. How Abundant Are Microplastics In Facial Cleansers? An effort to understand how face cleansers are contributing to microplastic ocean pollution was taken on by a research team in Auckland, New Zealand. They purchased four facial cleansers from a local supermarket and determined the size and amount of microplastics found in all four water-based cleansers. About 1.5 grams of each brand were mixed with water and strained for microplastics through a very small filter. The microplastics that accumulated on the filter were washed off and collected on a small petri dish, where their shapes and sizes were measured using a microscope. Microplastics collected from facial cleansers from Brands A – D.
Note the irregular sizes in A and C.
Photo Credit: Fendall et al. 2009. The research team discovered that all four facial cleanser brands contained microplastics, and they showed a variety of irregular shapes and sizes. They measured about 150 microplastic fragments per 1.5 grams for each brand, and the average size for all four brands ranged from 200 to almost 400 micrometers. 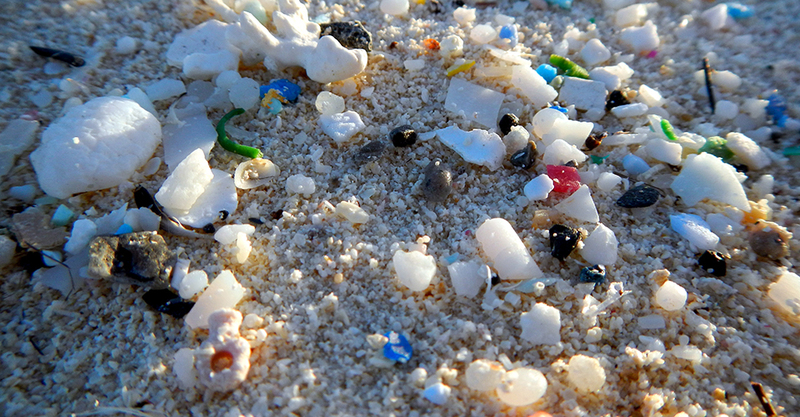 Some microplastics were as large as 1 millimeter. That’s about the size of a grain of sand, which ranges from 60 to 2,000 micrometers! Another interesting finding was the irregular shapes of the microplastics. Some consisted of uniform shapes, while others consisted of irregular fragments that can break into even smaller pieces. These very small size particles with irregular shapes could spell trouble for many marine organisms. Microscopic organisms, such as zooplankton and small fish, may confuse microplastics for food. Plastic pieces are known to block the digestive systems of these small creatures, and eating enough plastic might cause them to starve. The same may be true for marine organisms that filter their food out of the water, such as mussels and barnacles. As larger animals, such as larger fish or seabirds, eat the smaller ones, these microplastics can accumulate and be found at higher levels of the food chain. Some of these microplastics could end up in fish that are consumed by humans. Another concern is the longevity of microplastics. Their chemical composition allows them to persist in the environment for a long time, only breaking down into smaller pieces due to wave action, sunlight degradation, or digestion by living things. The ever-shrinking microplastics become available to more marine organisms, but can also bind to other toxins in the ocean, such as persistent organic pollutants, which are a human-made chemical still found in many products today. These toxic chemicals can accumulate on microplastics over time, making them more toxic as they age. It is our responsibility to become aware of how our daily practices are impacting our marine environment. We can make the conscious choice to adopt environmentally friendly, household products and practices, such as organic products and reusing and recycling products, which can help mitigate our environmental impact. For facial cleansers, check ingredient labels for an ingredient called polyethylene, a common plastic that makes up microbeads and micro exfoliants, then make the conscious decision to select a more environmentally friendly product. The creation of waste may be inevitable, but the key may be in how we reduce or reuse waste, and avoid contaminating our environment.